Will Baseball Hall of Fame (2017) Voting Open Floodgates to PED Inductees, Further Erode Attendance? | Where Did You Go Joe Dimaggio? Home Uncategorized Will Baseball Hall of Fame (2017) Voting Open Floodgates to PED Inductees, Further Erode Attendance? Ostler couches his tongue-in-cheek comments, not really letting on to his personal beliefs but suggests its time to stop fooling around and just delete a few key words in the Hall of Fame voting rules-namely ‘sportsmanship, integrity, character’– that would allow PED users and likely users to easily make it in to the Hall. Shea is much more specific in his thoughts, which describe a very non-specific way in which he sees the Hall of Fame voting. Non-scientific or non-empirical is more like it. Then you have Barry Bonds and Roger Clemens , who never did really ‘come clean,’ quickly approaching the 75%threshold -over 50% overf voters selected them – necessary to make the Hall. Shea and others believe that they’ll both be voted in within another five years , while they’re still eligible in regular voting. Shea calls Hall of Fame voting ‘a big mess’ today with some voters not even voting for players under suspicion while others will vote for anyone with requisite production, regardless of PED use or suspiciion. 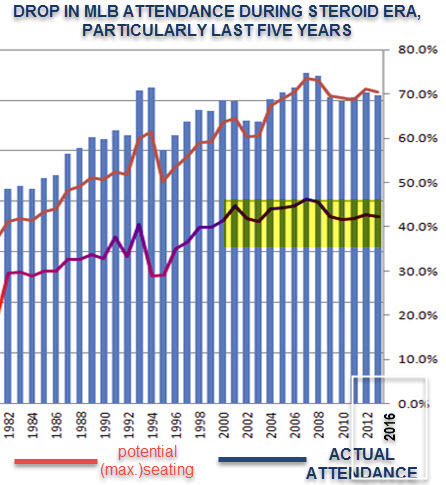 Shea feels that there’s a good chance that within the five years they’re eligible, Bonds and Clemens will probably get in the hall (editor’s note: especially with more younger voters more accepting of PEDs and less older ones). He expects even those under suspicion will make it, those such as more recent players like Andy Petite, Jason Giambi and Ortiz, who all come up for eligibility. 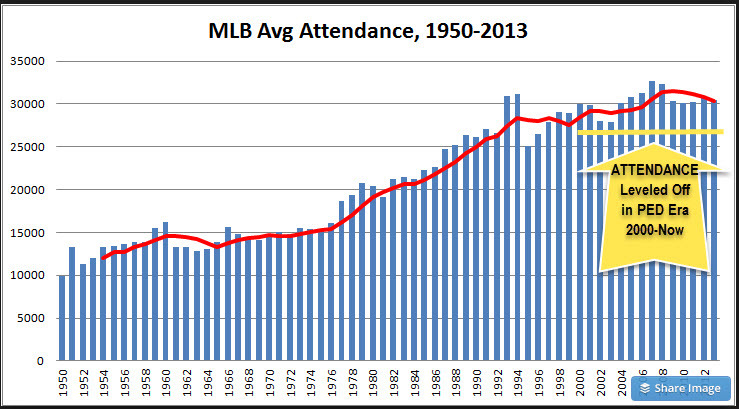 This chart shows how baseball attendance has fallen off during the steroid era, based on potentially filled seats. Will Baseball Hall of Fame (2017) Voting Open Floodgates to Widespread PED Inductees?